Mattie Spencer has spent the last decade raising her three younger and grooming Sweet Treats Bakery into a thriving business. Over the years, she's watched her sisters grow into beautiful women and find the men of their dreams. Now it's her turn, but, at thirty-five, she feels too old to dream of a husband and children of her own. Tyler Jacobs, a firefighter in the small town of Mount Ridge, keeps busy raising his seven-year-old daughter. 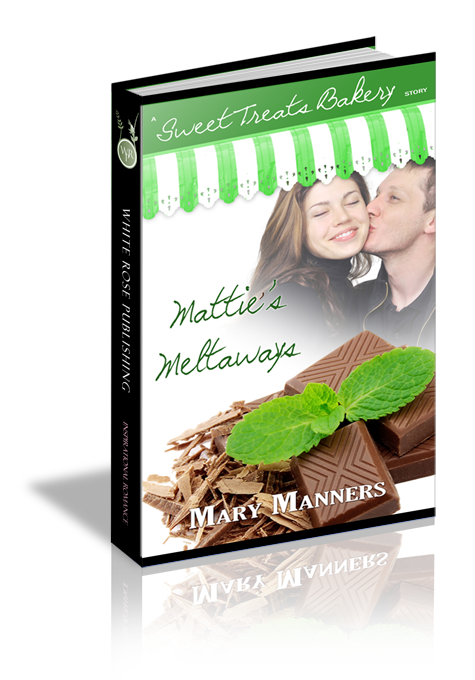 The death of his wife during three years ago still haunts him, but morning stops into Sweet Treats, along with a dose of conversation and a handful of Mattie's delicious mint meltaways, kindle a desire he thought was extinguished forever. Now Tyler has just one goal--to convince Mattie that love knows no age. The bell above the Sweet Treats door jangled. Mattie glanced up from the display case as the door swung open, ushering in a cold gust of air. “Mornin’.” Tyler Jacobs nodded and tugged scuffed leather gloves from his hands. He brushed sandy brown hair from dark, walnut eyes. Mattie didn’t miss the fine, jagged scar along his hairline—a reminder of the danger of his job as a firefighter. “Coming right up.” Mattie reached for a foam cup, poured a robust house blend. Her hands shook as Tyler trained his gaze on her, his deep brown eyes like rich, chocolate coins, and a bit of the cloudy brew splashed onto the hot burner, hissed and spat. “No. I’m fine.” She waited while he lifted her hand for a closer inspection. Her breath came in small gasps as his fingers gently skimmed hers. Mattie and Tyler have known each other for years, yet only as friends in passing. What do you think was the catalyst that began their romance? Q2. Do you think Mattie's fears of having a child later in life are valid? Tyler also has fears of losing Mattie during childbirth. What would you say to him? Q3. Mattie's Meltaways is based on Hebrews 11:1. a verse about faith. How has faith changed your life?